I’ve heard back from most of our group and am sending along some pictures from our weekend as well. The house was absolutely perfect for our needs. It’s a beautiful house and was a lovely location - very convenient to the highway and/or airports. The living room was set up so that we could talk and eat in front of the fire. A great way to spend a rainy weekend. We used the TV room for our jigsaw puzzle room and almost finished it while we were there. 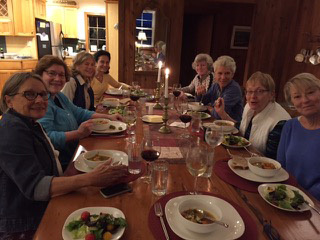 The big dining room table and kitchen were great for meals and more conversation! Having all the food taken care of was a really big advantage for us. Previous reunions have involved a lot of logistics planning meals/food/beverages. Lauren’s appetizers, soup, bread, salad, apple crisp, and brunch were delicious and wonderful. Lauren did a great job. She was very hospitable, stayed as long as she needed to, made sure we had her contact info, is a lovely hostess and a great cook. We really didn’t need to have any other food and that removed a complicated layer of planning and execution. We happily ate left overs for most of the rest of the weekend. And, there was plenty of wine! 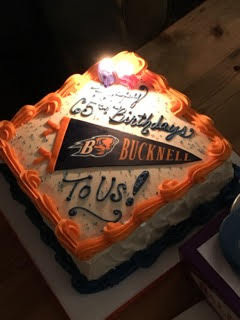 Thanks, too, for your help in coordinating the 65th birthday cake, too! Overall, we could not have had a better venue for our reunion weekend and it will be a hard act to follow. Thanks again for sharing your lovely home with us.